Friends of Green Lake is a group of lake users, from both within and beyond the Green Lake neighborhood, working to secure a healthy lake for wildlife and recreation. We are a grass roots organization of citizens devoted to doing what we can to support our mission. This group evolved from a small core who worked hard to obtain signatures from the community to bring a focus to the problem at the time, which was a horrific blue algae bloom. We set up A-frames near the bike/walk path with a document explaining what we were doing and why we needed community support. At other times, we attended events at Green Lake to ask passer bys for their support. As a result of these efforts, enough signatures were gathered to make an impression on the then superintendent of the City of Seattle Parks department to get us an audience with the mayor (Greg Nickels). The group has grown and evolved through the years. We now participate yearly in the Open Swim at Green Lake and the Milk Carton Derby where we set up informational booths. In addition to this, we have given back to our neighborhood in other ways. Some of these other activities include: organizing work parties the first Saturday of each month to clean up the shoreline and remove blackberry canes and roots, plant native foliage to preserve bird habitat, and remove the non-native Asiatic milfoil fouling areas of the shoreline (many people from around the lake participate in this effort); sponsoring bird walks around the lake for the population of bird lovers who enjoy learning more about the natural wildlife at Green Lake; presenting a program at monthly meetings designed to provide educational information about topics pertinent to wildlife, flora and fauna around our city treasure, Green Lake. We also encourage participation from the students from Billings Middle School who have presented monitoring reports to our group. 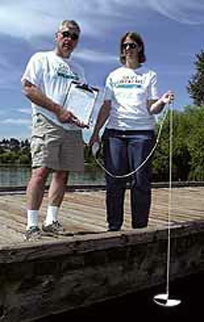 FOGL members standing on a Green Lake dock use the Secchi disk to measure water clarity. This is truly a neighborhood group that outreaches to the community for continued support of keeping Green Lake a keepsake for everyone in the city of Seattle. Lobby for consistent and thoughtful lake management and stewardship. Work with lake water management scientists, engineers and professionals to research and plan long-term solutions to Green Lake’s water quality problems. 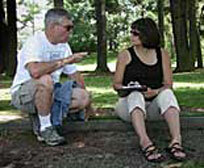 Encourage community involvement in issues regarding Green Lake’s water quality. Involve local teachers and students in lake science and monitoring. Inform local media and the community about the lake’s water quality issues.